What Kind of Whey Protein Powders Are There? What Are the Benefits of Whey Protein Powders? How Do I Take Whey Protein Powder? When Should I Take a Whey Protein Shake? Are There Any Side Effects of Whey Protein? How Do I Pick a Good Whey Protein Powder? In order to help you find a good product we’ve researched & compared the best whey protein supplements on the market right now. Award winning – Gold Standard has been named the Best Protein of the Year and the Best Supplement of the Year by Bodybuilding.com for 10 years straight! Whey protein isolates – the purest form of whey protein. Whey protein concentrate (premium, ultra-filtered) – a high quality, balanced and quickly-digested form of whey protein, which gets to work fast. Whey peptides – the fastest-digesting form of whey available. 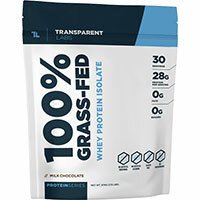 Transparent Labs uses 100% pure whey protein isolate, sourced responsibly from grass-fed cows in New Zealand. It’s one of the cleanest products on the market, and the best organic protein powder available. It’s one of the healthiest protein powders on this list, and it provides all the protein your body needs to perform and recover efficiently, with none of the unnecessary junk found in many supplements. The price of this product is a bit higher than average, but it’s absolutely worth the cost because of the high-quality, clean and pure ingredients. 28g 100% whey protein isolate – sourced from grass-fed cows in New Zealand. Whey protein isolate is the purest form of whey protein. 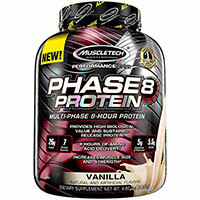 MuscleTech Phase 8 is an extended release protein powder that delivers sustained release amino acids from a high biological value protein blend. A single serving of Phase 8 can provide up to 8 hours of “muscle food”, AKA amino acids. Phase 8 uses a blend of 7 different protein sources to deliver a balanced protein load. 26g protein blend consisting of whey protein concentrate, whey protein isolate, hydrolyzed whey protein isolate, 97% whey protein isolate, milk protein concentrate, calcium caseinate, and micellar casein. 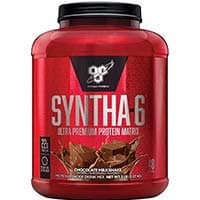 BSN Syntha 6 is a protein powder designed to provide sustained release protein over several hours. By using an innovative blend of 6 different protein sources, Syntha 6 provides a steady stream of amino acids to your muscles. It’s not necessarily the cheapest protein powder in terms of overall protein content, but given the wide range of high-quality protein sources it uses, it is priced very reasonably and provides great value. 22g protein blend consisting of whey protein concentrate, whey protein isolate, calcium caseinate, milk protein isolate, egg albumen, and glutamine peptides. 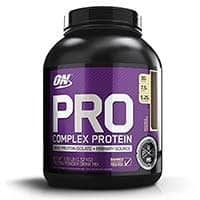 Pro Complex is an all-in-one protein powder blend from Optimum Nutrition. It contains a blend of several different protein powders to deliver optimized results. This product has the highest protein, glutamine and BCAA contents, making it an effective whey protein supplement for muscle gain. It may seem expensive at roughly $3 per serving, but keep in mind that a single serving of this product contains 2-3x the protein and BCAAs of the average protein powder. 60g protein blend, consisting of whey protein isolate, a hydrolyzed whey protein isolate, egg protein, hydrolyzed egg protein, and added leucine peptides. 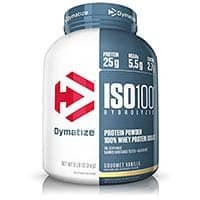 Dymatize Iso-100 is a high quality hydrolyzed whey protein powder designed to stimulate muscle growth and recovery. It uses 100% hydrolyzed whey protein isolate to deliver a fast-absorbing stream of amino acids to fuel your muscles and optimize results. Award winning – recipient of the Bodybuilding.com Award of Excellence and other prestigous awards. 25g hydrolyzed whey protein isolate – the purest available form of whey protein. Delivers the amino acids and nutrients your body needs quickly and without fillers or “fluff”. 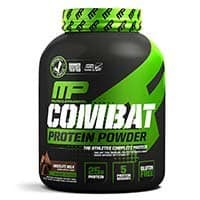 MusclePharm Combat Powder uses a blend of 5 powerful proteins to deliver fast, medium, and slow-releasing protein for up to 8 hours. It’s designed to be an all-in-one product, eliminating the need to take multiple protein supplements. 25g of a proprietary blend, containing whey protein concentrate, whey protein isolate, whey protein hydrolysate, micellar casein, and egg albumin. 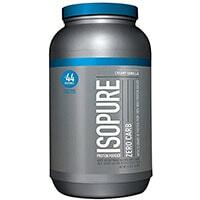 Zero Carb Isopure from Nature’s Best is a high quality protein powder made from 100% whey protein isolate. With a whopping 50 grams of protein per serving, plus ZERO carbs, this product is the best lean protein powder available. 50g 100% pure whey protein isolate – the purest form of whey protein. ISO HD Whey Protein Isolate and Hydrolysate is a pure protein powder that is easy to digest. The rapid-absorption of this protein make it ideal post-workout, as amino acids can be delivered faster, right when they are most needed. ISO HD is also low in fat, sugar and calories, so it fuels your muscles, without affecting those abs you’ve worked so hard for. 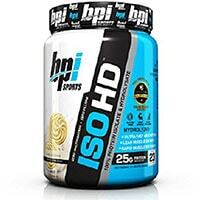 Who makes it: ISO HD is made by BPI sports, one of the biggest brands in sports nutrition in the US. BPI sports is committed to producing the most-effective, highest quality supplements. All BPI products come with a 30 day money back guarantee, so what have you got to lose? Try ISO HD today! 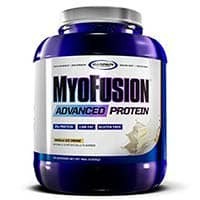 Gaspari Nutrition Myofusion Advanced Protein uses a 6 stage protein blend, plus a patented probiotic formula, to deliver time-release protein. 25g of protein blend, made up of whey protein concentrate, brown rice protein, whey protein isolate, casein protein isolate, egg albumin, and whey protein hydrolysate. Whey protein is a form of protein derived from whey. Whey is found in milk, and is a natural byproduct of the cheese making process. If you’ve ever opened up a container of yogurt and noticed some liquid at the top – that’s whey! During the process of making cheese, liquid whey protein is separated from the other elements of milk. Producers then process and dry the whey into a powder form. From there, whey protein is sold in supplement form, or added to various foods and energy bars to increase protein content. Whey protein is very rapidly digested, which makes it an ideal protein supplement for athletes who need a quick boost of protein post-workout. Whey also has a very high amino acid content, which is great for a number of health benefits. Whey protein supplements are simply pure whey protein in its powdered form. Often they will contain flavoring and/or other types of protein to deliver a balanced blend of nutrients. They are commonly used by athletes, weightlifters, and people on low-protein diets. Athletes will experience the most whey protein benefits, but in reality, many different people can benefit from taking these products. The benefits of whey protein are much more extensive than you might think, with many significant proven positive health effects. Whey Protein Concentrate: Perhaps the most commonly used form of whey, whey protein concentrate is fast-acting, affordable, and widely available. Concentrate typically contains around 80% protein, although it can vary widely. Whey protein concentrate is also relatively high in lactose, so those folks with a lactose sensitivity should avoid concentrate. Whey Protein Isolate:Widely considered the best form of whey protein powder, whey protein isolate typically contains 90-95% pure protein. It’s very low in fat, and in lactose, so even people who are lactose intolerant can often be fine taking good whey protein isolate powders. Isolate is toted as the “premium” form of whey, and we tend to agree. With that being said, it’s higher purity and protein content make it a bit more expensive than more affordable alternatives like whey protein concentrate. Hydrolyzed Whey Protein: This form of whey involves protein that has been broken down to increase absorption rates. Basically, long-chain proteins are broken down into shorter chains, known as peptides. This makes the protein easier to digest. Hydrolyzed whey protein is typically fairly expensive, and is not commonly used as the main type of whey, although it may be added to good whey protein blends. Those are the main three types of whey, although there are others. Many whey protein products will contain a mix of these forms. They are also usually packed with antioxidants and BCAAs. Branched chain amino acids (BCAAs) in particular have some very important benefits, and whey is one of the best sources of these amino acids. These products typically come in powdered form. They are generally flavored, although some are unflavored. For the most part, to take a whey protein supplement you’ll just want to mix it with water, milk or juice, or mix it into your favorite shake. At home, many people like to make delicious protein shakes, using a whey protein supplement, plus fruit, veggies, ice, milk, or whatever other ingredients are laying around. If you crave variety, you’ll want to choose a simple whey protein flavor, like vanilla or chocolate, that is flexible enough to mix with a variety of other ingredients. For on-the-go use, you may want to consider picking up a BlenderBottle. These handy little devices make mixing whey protein into shakes a breeze while out and about. Blender Bottles have a small metal ball whisk in them that helps mix powdered supplements into water or milk with just a simple shake. They are useful for any type of powdered supplement, but can be particularly useful for protein shakes post-workout. If you’re wondering when to take whey protein powders, that depends on why you’re using them. If you’re taking a whey protein powder as a way to help recover from your workouts, you’ll want to consume a serving of protein immediately following your workout. In order for your muscles to recover as quickly and completely as possible, they need protein and carbohydrates as soon as possible. So, if you’re heading to the gym, either bring a shake with you (use a BlenderBottle!) or be prepared to take some protein immediately after you get home. If you are using whey protein as a general health supplement, the timing is of less importance. You can simply use protein powder as a supplement to your diet. While whey protein is a great way to supplement your diet, note that it is not a complete source of nutrients, so if you’re planning on using it as a meal replacement, do some research and speak to your doctor about what else you should be consuming to meet daily nutritional needs. Whey protein is regarded as a safe supplement when taken as directed. As long as you don’t take too much, you shouldn’t have any problems. One thing to note is that since whey protein powders are made from dairy, those who are lactose intolerant may experience lactose-related side effects from consuming whey protein. Whey protein isolate contains significantly less lactose than whey protein concentrate, so keep that in mind if you are sensitive to lactose. There are a ton of different whey protein supplements out there, so choosing the best one for you can sometimes be a challenge. Protein Content: First and foremost, take a close look at the ingredient label on any product(s) you’re considering to get an idea of how much protein is in each serving. Typically, you’ll find products in the 20-30g per serving range. Also, keep in mind that some whey protein powders also contain other types of protein mixed in, such as casein. This is not necessarily a bad thing, but it’s something to take note of. Type of Whey: There are a few different types of whey protein, each of which offer particular pros and cons. 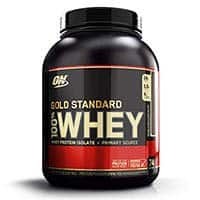 In general, whey protein isolate is the most recommended, but other forms such as whey protein concentrate and hydrolyzed whey protein are also good choices. Many whey protein powders contain a mix of these types to provide a balanced blend of benefits and nutrients. Flavor: The vast majority of whey protein powders are flavored. Clearly, you’ll want to find a flavor you’ll actually enjoy – otherwise you won’t want to take it! Since there are a ton of flavors out there, to select a good one for you try to think about how you plan on using it. If you want some flexibility; i.e. you want to be able to drink it straight, mix it in smoothies or toss it in pancakes, go with a simple flavor like vanilla or chocolate. If you’re more likely to just drink it straight mixed with milk or water, go with whatever flavor sounds tasty to you! You can also read user reviews to see what other folks think of the flavor. Brand Quality: Since there are so many companies making whey protein supplements, you’ll want to pay attention to the company behind each product you’re considering. Choose products from reliable, trustworthy companies with good reputations. On our list above, we’ve only selected products from excellent and trustworthy companies. Value: Whey protein is relatively inexpensive, but if you take it every day it can certainly add up. Typically, you’ll be looking at somewhere between $0.50 and $1.50 per serving, which can translate to $15-$45 a month for daily users. So, take value into account when choosing a product. But, also keep in mind that cheaper does not mean better, so try to find a quality product at a reasonable price.